When the day was over we had covered 23.1 miles (37.2581 km's) under 44,469 steps and picked up $0.03 from the road. Findings for the day: 1 5/8" socket, 1 9/16" socket and 3 pennies. 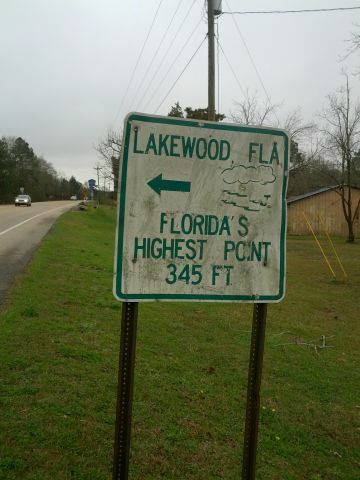 We went from Paxton, Florida down route 331. In De Funiak Springs we did an east turn onto route 90 which will be our home until we get to Tallahassee. Sunday was a day off where we watched it rain, and rain, and rain, and rain, and rain. After the rain stopped it then rained some more. Motor home still leaks, guess it is time for some legal action. Remember, trust BUT verify!!! Monday we moved, in the rain, from Evergreen, Alabama to Bonifay, Florida. Prices as well as temperatures seem to be increasing as we head south. Ozark, MO gas was $2.94, today we filled up at $3.54. See ya'll down the road...cheers!!! Walking Day #155...Saturday, February 9, 2013...farewell Alabama, hello Florida...thank you, James!!! WOW!!! What a day!?!?!? A wrong turn, picked up the mail and sent some paperwork off, ALL before 8:30 AM!!! Today I walked for a friend who recently passed away, Joan Donnell and the sister of I.V. Webb, Pattie, who is battling cancer. All the best to Joan and Pattie's family and friends. The day started out clear and sunny with a wee bit of spring crisp in the air. Shortly after I got started I stopped to chat with a gentleman working on his fence. 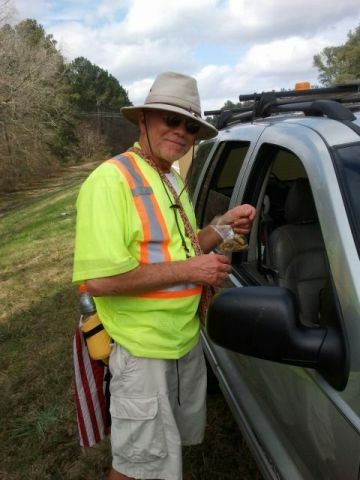 "Al", a retired truck driver, former Marine, current farmer and VA volunteer was out moving a fence line before the state of Alabama mandated it. Thank you, Al, for your service and thank you for your volunteerism. There are seven billion of us crawling around on the planet and ALL we have to do is a single kindness to another person and what do we have? Perhaps a stretch goal would be seven kindnesses. Some time after my conversation wilt Al a pickup with "Disabled Veteran" plates stopped me. "James" had heard about me at a convenience store where I stopped and wanted to contribute to the "cause". A veteran and specifically a disabled veteran will ALWAYS elicit an emotional response from this curmudgeon. You, SIR, have made your contribution and this gesture is well above and beyond. At some point St Peter WILL be giving you a free pass. Your contribution will be put to good use by Dr. Dave Okubo and Camp UTADA. Thank you again for your service and your generosity. 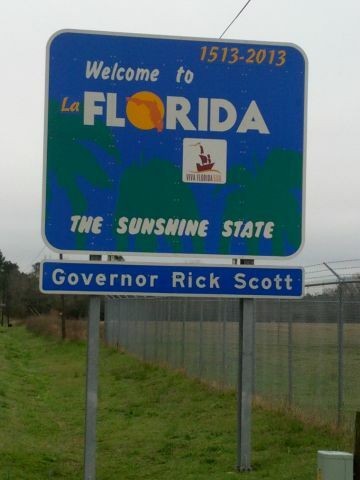 Thank you, Robert Poole, (trucker driver) for your advice as to various roads in Florida. Turns out that both Robert's mother and aunt passed away from cancer. 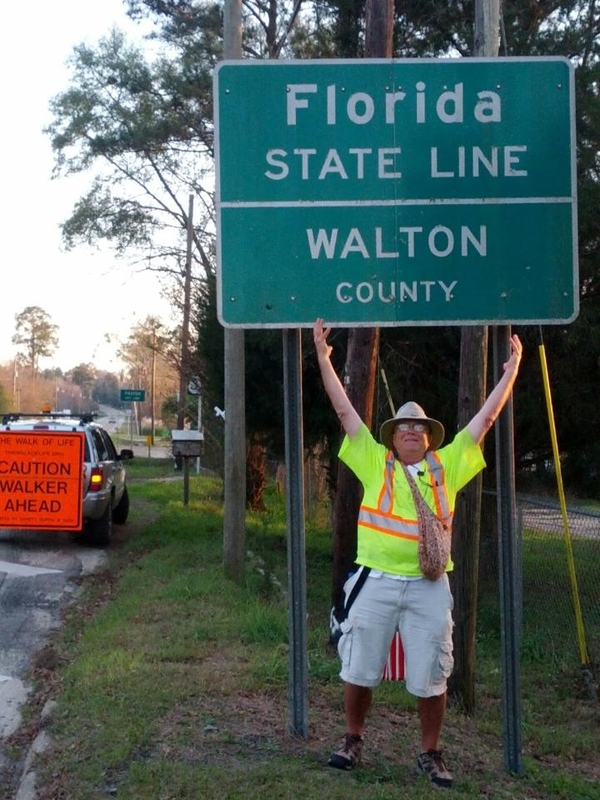 At approximately 4:59 PM, Central time we crossed from Florala, Alabama into Paxton, Florida. It still hurts my brain that I have walked so far. I shall resist the temptation to start a "count-down" and just focus on what I have be given, that being the here and now. I have no choice as to what comes down the road, all I can deal with is the present. When the day was over we had walked 20.7 miles (33.3871 km's) using 35,256 steps and picked up $0.03. Findings for the day: 1 carabiner, 1 threaded "C" link and 3 pennies (1 of which was picked up in Florida). Sunday will be a day off and Monday wil be a moving day to a spot in Florida that has yet to be determined. As my driver, Valerie, was anxiously awaiting her call to move further up (down) into Florida she engaged, in conversation, a young man, Wes, who as it turns out, was the last person with whom The Walk had contact with in the state of Alabama. Thank you, Wes, for representing the people of Alabama and sending us off into Florida! Best wishes to you! Today we did 26 miles (41.9355 km's) using 50,610 and collecting $0.10 off the roads. Findings for the day: 1 nickel and 5 pennies. Wildlife sightings: 1 large owl and 1 small owl. In Andalusia we left route 84 and hit route 55 south. When the day was over we made it all the way to mile post 18. Saturday we should cross into Florida. A very special shout out to Robbie Ballard of Cooper Tires and Debra Bennett who both made contributions to Camp UTADA. Dr. Okubo and the staff will find a good use for the funds. A special thank you goes out to Byron and Rhonda Bratley, in whose honor I walked today. They are both veterans of the Gulf War. See ya'll down the road...cheers!!! Thursday started out VERY rainy so we got a little extra sleep. By about noon the rain let up and we headed out into the sunshine and humidity. Considering where we are going it will ONLY be magnified, certainly the humidity. 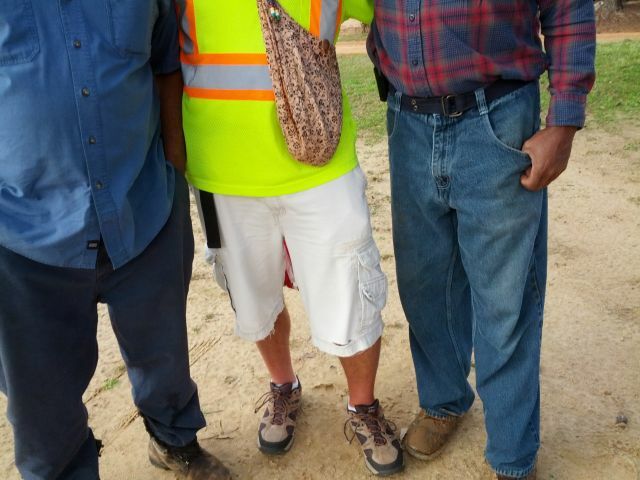 I was making pretty good time until I happened upon a couple of elderly gentlemen and thought I would stop and chat. The area, I believe, was the Herbert district. As I was chatting with the gentlemen a couple of younger gentlemen approached. As it turns out Taft (Jr, Jr)(I dubbed him such) and Jesse Lett were considerably more talkative. Taft, Jr. Jr. is to differentiate him from his father Taft, Jr. As it turns out Jesse spent 20 years in the Army. After I explained what I was up to we started chatting about a variety of topics. Between the two of us (Taft, Jr. Jr. mostly just looked on and soaked up what the two "elder statesmen" had to say) we had covered religion, politics, slavery, racisim, life in the South, life in the Interlake area of Manitoba, history, education and a few other "minor" topics. "Jesse-ology 101" could easily be described as "Arthur-ology 101" or just plain old PRACTICAL living!!! I find it refreshing to chat with someone who has views closely aligned with mine. I would dare say that if I lived in the area Jesse and I would be friends and would spend a good deal of time together. Thank you, Jesse for your service, thank you for your views on life and thank you for sharing your views in such a candid manner. Best wishes to you in your business AND as you educate ALL people that come in contact with you. Jesse, you are indeed a breath of fresh air. When the day was over we had walked 12.7 miles (20.4839 km's) using 24,368 steps and picking up one beat up quarter. I saw one deer, two vultures and one owl. We ended The Walk today at the intersection of route 84 east and county road 47. If all goes well we should be crossing over into Florida late Saturday afternoon. I cannot speak for you BUT I am truly amazed!!! See ya'll down the road...CHEERS!!! The day started out VERY foggy with visibility at about 200 yards (190 meters). Parts of the trip looked rather erie with the fog, the dim light and the trees of various heights and types. Had my phone (camera) been working I would have taken a picture. Oh, by the way, the Jeep is back 100% operational. Cleaning the battery posts and cables did the trick. By mid morning the fog had dissipated and we were back in good old sunshine. Sure is nice to be back in short sleeves and shorts. When the day was done we had walked right through Evergreen, which I would expect in its prime was quite a thriving community. Now, like most rural small towns, half the buildings are boarded up. The count today was 22.8 miles (36.7742 km's) under 45,692 steps and picking up one red cent. The findings for the day: 1 #11 wrench, 1 #12 wrench, 1 pair of brown ladies sunglasses and 1 penny. No profound thoughts or epiphanies just a lot of logging trucks and no shoulder. I did pick up a decent map of Florida. See ya'll down the road and see some of you in Key West in a couple of months. Cheers!!! Monday was an errand day and a moving day. It was also a very pleasant day weather wise. Between sporting events Sunday I got a couple of loads of laundry completed but had to save a few loads for Monday. Several loads later and several distractions later the coach was all packed and we hit the road for Evergreen, Alabama. A stop at Walmart in Monroeville for some groceries delayed us a wee bit and the last leg was traveled in the dark. Monroeville, Alabama is the home of Harper Lee the Author of "To Kill a Mocking Bird". The book is based, in part, on experiences that Ms. Lee had in this area as she was growing up. I must confess it felt a little odd as I walked through the countryside that was the setting for the book. Both the book and the movie occupied a good deal of my mind throughout the day. It was somewhat surreal to replay the story over and over in my mind. We are not very far removed from a time and place that is/was a significant blemish on this great country. May we all use the past as a reference point as we ALL move forward with greater enlightenment as a result of having gone through a period in our history where significant injustices were done. Even though Americans did not invent slavery, this country was a perpetrator of a system that has gone on ever since the human race slithered out of a swamp. By the time the issue of slavery came to a head in this country, communication had developed to a point where the unspeakable (which must be spoken) horrors of slavery had become common place. Couple that with the blatant racisim of the reconstruction era and beyond, we find that we swapped one set of horrors for another. Let us all NEVER forget the past so that we shall NOT repeat its horrors. Let us ALL move forward in a spirit of healing and enlightenment. So last night as I slid between some freshly laundered sheets I was horrified to remember that I had forgotten to take the last load of sheets out of the dryer at the Corps of Engineers Camp! This morning my able driver dropped me at the starting point and she went back to retrieve the missing sheets. Fortunately she was successful! Today when the day was done we had walked 20.5 miles (33.0645 km's) using 41,325 steps while picking up one thin and beat up dime. The findings of the day were: 1 round nosed shovel, 1 Stanley flat-head screwdriver and 1 thin dime. The weather was delightful for walking. There was a fair amount for construction on route 84 east and I had occasion to chat with several of the workers, some of whom fit into the two health related honor categories of the walk. 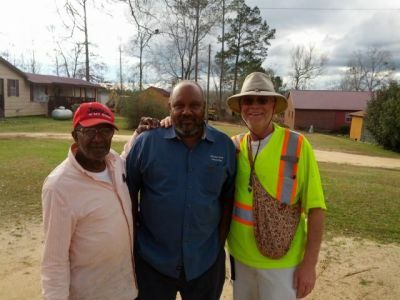 At one point I had a brief conversation with one, James McMillian (who is living with diabetes) who thought I was part of the road crew. I gave him a card and wished each other well. Several miles later I was surprised to see him again when he pressed into my hand a generous contribution. Dr. Okubo and Camp UTADA will surely find a good use for the funds. Thank you, sir, for your generous contribution. After the walk ended for the day I decided that we would stop for dinner so I could get home to finish up the blogs from previous days. An hour and a half spent searching for a little eatery, Zack's, proved fruitless even with the aid of GPS. In fact this was one of those situations where we went deeper and deeper into the abyss of back-woods Alabama only to have the "voice" announce that we had arrived at our destination when in reality we were in the middle of nowhere. I thought for a minute that I heard a banjo being played! Bubba's BBQ was the final destination for dinner (YUMMY) and then back home only to have seen significant time elapsed such that I only had time for todays blog and no time to catch up the previous three days. Better luck tomorrow. Still puzzled as to how in the world I can generate another blister (on the bottom of my foot!) after walking nearly 3,200 miles and having rubbed 28 gallons of alcohol on my feet!!! I guess when I figure that one out I will find the errant sock and underwear that disappeared on me! We finished the day walking between mile post 62 and mile post 82. See ya'll down the road...cheers!!! I will finish this up Monday...half day today, Monday will be moving day...14.3 miles...go 49'ers!!! Perhaps I will chip away over time. The findings for the day: 1 package of 4" zip ties (of the original 50, 14 remaining) and 3 pennies. A special shout out to the folks at the Mackey Branch Baptist Church #2 for the pleasant conversation and the contributions. Camp UTADA will put the funds to good use. I bless you for your generosity. When the day was over (early on account of they Phoenix Open AND the Super Bowl) we had logged 14.3 miles (23.0645 km's), taken 28,059 steps and found $0.03. Other than the three pennies no other items were found. Cheers!!! Walking Day #149...Saturday, February 2, 2013...Groundhog Day!! !...Whistler and Pleasant Grove. Have I taken THAT step before??? In the last couple of days I have past a Whistler AND a Pleasant Grove!! !, What's up with that!?!?!? Late start today due to Jeep battery issues AND it just when it seemed the problem was solved IT shows up AGAIN!!! Ahhhhhhhhhhhhhhhhhhh Groundhog Day all over again!!! Sunday will be a quickie (10-15 miles ONLY) as there is a football game in the afternoon, GO 9'ers!!! Thanks, Bimbo, for the followup call. Yes, the rural folks seem to spend a good deal of time givings others a hand, including strangers. Continued success with the restaurant, the food was GREAT, the chicken OUTSTANDING and the conversation delightful (of course we agreed on EVERYTHING!!! )...more to come The Walker is sleepy!!! A special THANK YOU!!! goes to Jackie C. for his contribution to Camp UTADA as well as that of Alex. Your support is appreciated and know that you will have made a difference in a child's live. When the day was over we had walked 20.6 miles (33.2258 km's), taken 40,316 steps and found one penny along with Wlhelmina W.'s employee badge with the Alabama Department of Transportation. Cheers!!! We walked 22.2 miles (35.8065 km's) under 37,211 steps (YES I was cruising!!!) and found $0.28. The findings of the day: 1 9/16" socket, 1 live 20 gauge shotgun shell (yellow), 1 quarter and 3 pennies. Cheers!!! Wednesday was a rain day. The entire day was under a tornado "watch" for this general area. All we saw was a lot of rain. The rain only reminds me of the one slide that still leaks. I will have it looked at again when I get to Tampa. So yesterday was going to be a sightseeing day (in the rain) but we discovered that one of the radios grew legs and disappeared. After searching high and low, inside and out we determined that it probably ended up in a trash bag and then into the dumpster. With a radio missing we headed for Laurel to get another set at Walmart. Same worthless Motorola radios, advertised as good up to 27 miles! I sent them an e-mail to see what conditions would have to be met in order to make that 27 miles number. In all reality they are good for MAYBE a mile, two if it is line-of-sight. I assume they have no interest in supporting their claim to me as I have yet to hear from them. Until they show me otherwise I shall say that the advertising is at best false. 'Nuff of that. Today we got a wee bit of a delayed start but walked in sunshine, a gentle tail wind and tempuratures in the high 50's low 60's. The excitement for the day was a driver taking a nap with the lights on! OOPPSS!!! That WILL take a toll on an already over-worked battery. A call to AAA and all was well. Got home, dumped the tanks and fixed some dinner. At approximately 3:00 PM we walked into Alabama, in spite of the dead battery. When the day was over we had logged 21.1 miles (34.0323 km's), took 42,311 steps and picked up one thin dime. I also found a door magnet from Auburn and a hitch pin. I saw one small deer early in the day and lots of vultures circling over head. When all was said and done it was a great walking day and as my mother would say, "nobody died" AND Valerie (the driver) DID get a great nap! See ya'll down the road. Cheers!!! Walking Day #146...Tuesday, January 29, 2013...more milestones!!! Today, under threat of rain, we went from just east of Laurel to just west of Waynesboro, MS. for a total of 25.5 miles (41.1290 km's) using 50,357 steps and picking up $0.77. Findings of the day: 1 pair white "Wiley X" sunglasses, 1 one wallet with ID for one "Destinie" of Laurel, MS. (I will attempt to hand her information off to a police officer),1 plastic copy of a penny (odd), 3 quarters and 2 pennies. Wildlife sighted: 1 turtle 8". The milestones for the day are I crossed over 6 million steps for The Walk and I now have less than 1,000 miles to go. Walking Day # 145...Monday, January 28, 2013...more records!!! 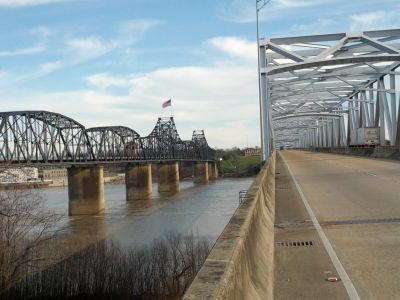 Sunday was a moving day from Clinton, Mississippi to Coffeeville Lake Service Park (US Corps of Engineers) on the banks of the Tombigbee River, 20 miles into Alabama on route 84 east. The place is deserted and quiet. Our spot is right on the river, 30 yards maybe. Wonderful moon rises last night and tonight. Since this is a government park it is very clean, very scenic, with 50 amp power and tasty water but NO sewer!!! According to the camp host, Don Johnson, "they ran outta money" when the park was remodeled a couple of years ago. (When is the last time you heard of a government project running out of funds, they OWN the printing press!!!) There is a shower house right across the street so we will limit water usage in the motor home to bathroom and kitchen use. Today we started on route 28 a mile west of Summerland and walked to a point about a mile east of Laurel on route 84 east. When the day was over we had 22.5 miles (36.2903 km's), expending 45,399 steps and picking up $0.96 consisting of 65 coins, a new Walk record. Findings for the day: 1 1/2" socket, 1 Pro V1 (rather beat up), 3 dimes, 1 nickel and 61 pennies! (all but 1 dime and 6 pennies were found in one group at one intersection. I guess someone got tired of carrying around the penny jar and just dropped it. Wildlife sighted: several vultures perched in a tree and several deer on the way home tonight. Due to the late hour and travel time we stopped in Waynesboro, MS for dinner at Huff & Puff's BBQ, YUM!!! Tomorrow will head back to Laurel and put in another 20 something. See ya'll down the road...CHEERS!!! Saturday was time to add a few miles to the 3,000 milestone and get closer to Key West. When the day was over we had stopped about 38 steps west of Summerland, Mississippi on route 28 east. After a few issues with the odometer it was determined that we went 22.4 miles (36.1290 km's), taken 45,186 steps and found $0.36 in coins. Mize, Mississippi was on the way. Seems like a nice little town supporting the forestry industry in the area. I also felt like a celebrity! Upon entering town a couple of teenaged girls wanted to know what we were up to. When it was all over they had grabbed a brother and we were having a photo op by the side of the road. 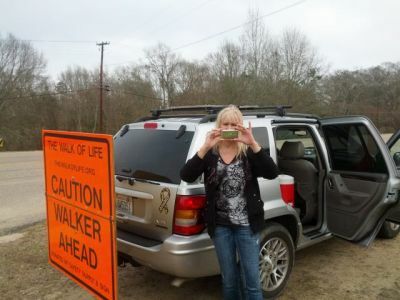 The picture shows Angelica, The Walker, Abby and Bailey. Thanks guys for the welcoming committee! As I walked through town a young man in a pickup stopped me to see where I was walking. Upon hearing what I was up to he reached into his wallet, as he did so he informed me that his mother is living with diabetes. 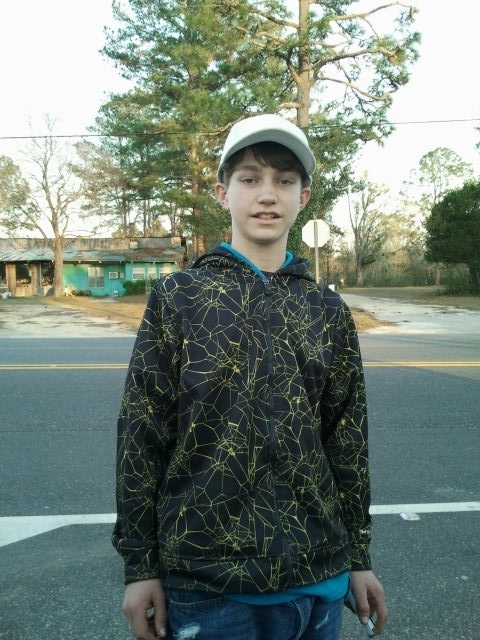 Jacob, your contribution will go to Camp UTADA to assist children with diabetes. Thank you for your interest and your generosity. On the road out of town Rene stopped my for a picture and a few miles later Sandy and two of her triplet granddaughters stopped me as well. Just as I was about to take a picture of them my battery ran out (hate when that happens!!!). Sandy works for the Mississippi Department of Public Safety. She shared that her son had been killed by a drunk driver a number of years ago and urged me to walk safely (always facing traffic) To lighten up the trip a wee bit she gave me a nice promotional flashlight with drunk driving caution on it. The area has a big forestry industry and many logging trucks passed by. I almost felt like I was in British Columbia when I smelled the fresh cut pine logs. I am sure, this area, when the winter grey gives way to summer green will look wonderful. Large trees, gently rolling hills, a nice road for a motorcycle. A little shopping on the way home delayed us a bit and were too late for BBQ at Sylvester's Mississippi Style BBQ (5555 Highway 18 W, Jackson, MS 39209) rumored to be the BEST BBQ in the area. The gentleman working the front counter was kind enough to give us his last two small containers of sausage, YUM! If that is any indication of what the rest of the food is like I MAY have to check it out next time I come through the Jackson area. This area definitely requires a "re-do". The Froghead Grill ended up getting our dinner business. Our poor waitress, Jessica, didn't know what to think as Valerie ordered her entree then I followed up with enough food to feed three people! HEY, us power walkers have to have LOTS of food to fuel our habit!!! Jessica, I trust it turned out to be a pleasant experience. Sunday will be a moving day, not sure where yet but it will be somewhere in Alabama on route 84. Thanks for all the support and encouragement as I wander about the country. See ya'll down the road...CHEERS!!! Walking Day #143...Friday, January 25, 2013...3,000 miles!!! 3,000 miles!!! THREE THOUSAND MILES!!! WOW!!! 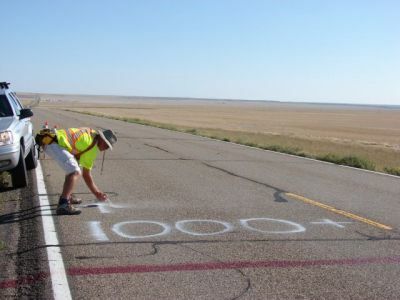 At approximately 1:29 PM, Central time I crossed the 3,000 mile mark! 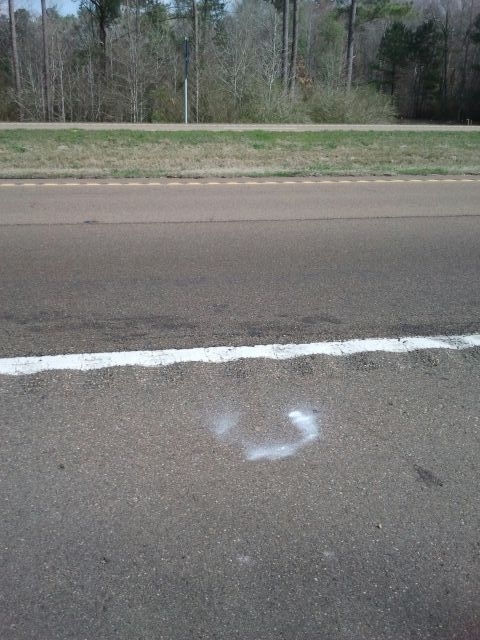 We were about a mile north of Mendenhall, Mississippi when that moment occurred. Unfortunately the wind was blowing and I was unable to deface the roadway as I so ARTistically did when the 1,000 mile mark was crossed. To be honest (NO other way) this milestone is just a "blip" on my screen. I am saving myself for the finish line!!! It does not seem real. What I am REALLY having trouble with is the concept of going from San Francisco to Washington, DC, I would be there already, Seattle to New York, I would be there already. My CHOSEN path still has a thousand miles to go!!! Good grief!!! WHAT was I thinking!?!?!? A "little" ego perhaps!?!?!? I learned a long time ago that I can ONLY deal with what is, the past is just that and the future is only a wish, my whorl right now consists of step, step, step, step, repeat about 6,000 times an hour. It is definitely a "master teacher" for me to focus on the here and now, step, step, step, step. So I shall NOT dwell on this little milestone today. I shall embrace it for what it is and get some sleep so I can go for a little stroll tomorrow. "I don't know but I've been told, Key West, Florida's but a little stroll." When the day was over 23.1 miles (37.2581 km's) had been walked, 46,556 steps taken and $0.90 in loose change picked up. The findings of the day: 1 "Do It" brand 1 1/2" master trap "P" trap (still in the bubble wrap), 1 rather small purple and green dragon (just a toy!!! ), 1 1/2" wrench, 2 quarters, 2 "thin" dimes, 1 rather bent dime, 1 nickel and 5 pennies. Wildlife sighted: a number of vultures circling (WELL ahead of ME!!!) and a cardinal (love those red birds). We went from Piney Woods School down route 49 to Magee, then an east turn on route 28. We stopped just outside Magee. See ya'll down the road. CHEERS!!! Walking Day #142...Thursday, January 24, 2013...out of Jackson moving south...thanks 'Nette!!! Today I walked for 'Nette (Anette) and her family and friends. We left route 80 and made a south turn on route 49. Along the road we passed through Richland, MS. I stopped at The Do-Nut Shop Cafe for a coffee and bathroom stop. The food smelled so good that I succumbed to a breakfast burrito with salsa. While I was there I had a pleasant conversation with Rhitney and 'Nette (Anette). As it burns out 'Nette's life has been impacted by both diabetes and cancer so I decided that I would walk today in honor of her friends and family. All my best to you and your family and friends. Thank you for sharing your story and your best wishes. I was rather impressed with the Richland/Florence area. It seems like a rather thriving community. The weather was sunny and warm. The road very wide, two lanes each way with a median AND wide shoulders. Traffic was very heavy as this is the main road between Jackson and Hattiesburg. We finished the day at the Piney Woods School. Thank you to Barney Barnes, the security guard, for letting us use the parking lot and for a brief description of the history of the school. He was also kind enough to give us a couple of books about the history of the school. 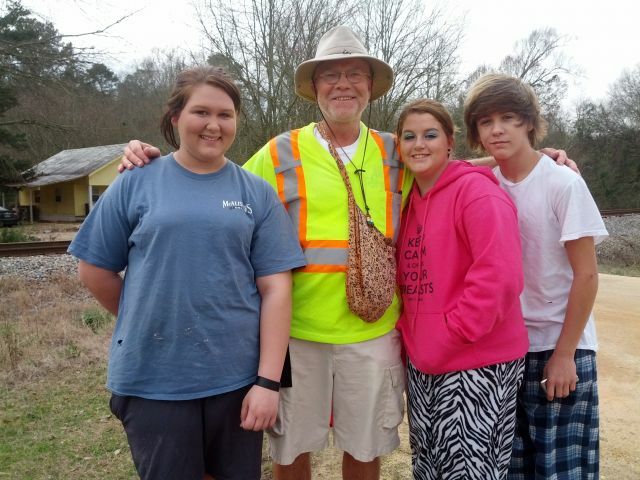 As it turns out Mr. Barnes is a Viet Nam era Army veteran and is also living with diabetes. Thank you for your service and your hospitality. Best wishes as you control your disease. When the day was over we had 22.1 miles (35.6452 km's) using 44,793 steps and collecting $1.29 in loose change. Findings for the day: 1 putty knife, 1 7/16 wrench, 1 "Handicap Parking" sign (well worn lying by the side of the road), 3 quarters, 1 thin dime, 5 nickels and 19 pennies. The Walk terminated today at the Piney Woods School on route 49 southbound. 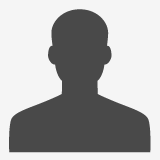 Tomorrow will bring a significant milestone. See ya'll down the road...cheers!!! After a well deserved day off Tuesady it was back on the road Wednesday. The morning was spent sleeping, reading and resting sore body parts. The afternoon was spent in Vicksburg with a Civil War history lesson. The whole sight would take several days to review, we spent about four hours. 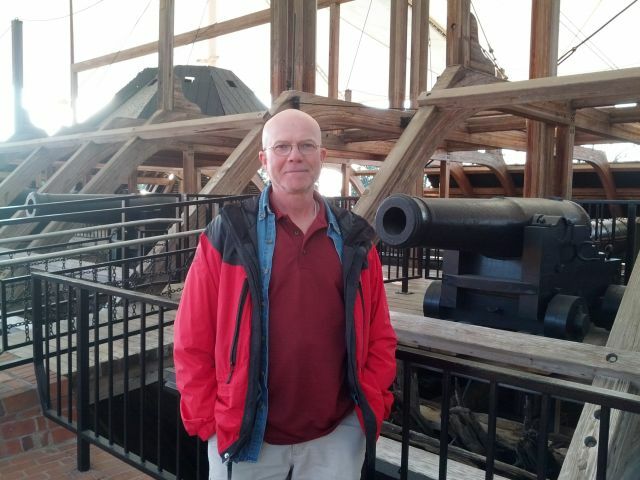 I was particularly impressed with the "Cairo" "iron-clad" museum and display. Today forests cover the battlefield, back then most of the trees were gone, either to build fortifications or as a result of cannon fire. On Wednesday we picked up just west of Bolton on Old Highway 80 and finished up in Jackson on Old Highway 80 and Terry Road. 22.9 miles (36.9355 km's) were walked under 45,192 steps with $0.53 in coins picked up along the way. Findings for the day: 1 name badge from "Shoneys", "Shanita" will either be waiting tables nameless or not waiting tables jobless, 1 5/8 socket, 1 quarter, 2 dimes and 8 pennies. Wildlife sightings: 2 turtles sitting on a log, 1 bright red cardinal and numerous vultures taking a leasurly soar on a sunny day. The weather was WONDERFUL!!! Sunny all day, temperatures hitting 70's. Roads with wide shoulders, people responding to my waves with a wave or a tap on the horn and sometimes both. I stopped at a Clinton fire station and chatted with firefighter "Stephan" and paramedic, Chris Marble. The detailed map on the wall of the station was particularly useful. A special thanks to Chris for his contribution, Camp UTADA and Dr. Dave Okubo WILL put the funds to good use. Thanks again for your support. This area is fairly heavily forested with gently rolling hills. Never met a railroad I didn't like. I would expect that in the summer it is quite scenic with all the trees in full leaf. Close to the end of the day I had occaision to stop and chat with a political up and comer, Jimmy Stewart. We had a pleasant conversation and I would expect that we would agree on many points. See ya'll down the road...CHEERS!!! Walking Day #140...Monday, January 21, 2013..."I have a dream........"...Martin Luther King, Jr.
Today I walked to honor Martin Luther King, Jr. A man of vision, a man of substance and a man of peace. Had I been born a few years earlier I would have been down here working on the civil rights movement. A number of years ago I had occasion to visit the King Memorial in Atlanta. If you get the chance I recommend that you go there. It was a very moving experience for me. When Monday drew to a close I had walked 20.6 miles (33.2258 km's), took 40,303 steps and picked up $0.05 (5 pennies). Today we finished on old highway 80 just a few miles shy of Bolton, MS...see ya'll down the road! Walking Day #139...Saturday, January 19, 2013...moving day plus Louisiana to Mississippi walking day...NARROW!?!?!? 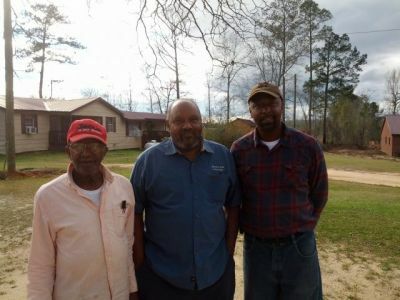 Thursday was moving day from Pecan Grove RV Park in Lake Village, Arkansas to Springridge RV Park in Clinton, Mississippi. Prior to our departure I picked up my five pairs of new shoes, should be walking on a cloud from now til the end. Breaking them in will be a bit unpleasant, BUT the end result will be wayyyyyy better shoes. Before we left Pecan Grove, Steve C (the new un-hired man!) gave us a tour of the premises and the cabins. Authentic early Arkansas accommodations from both sides of the socio-economic scale. History CAN be a great teacher if we just listen. Sometimes that listening MUST be accompained by a rather tamed ego. If in doubt go see "Django: Unchained". After we landed in Clinton we dropped by the carwash to make sure the Jeep represented "The Walk" in fine fashion. 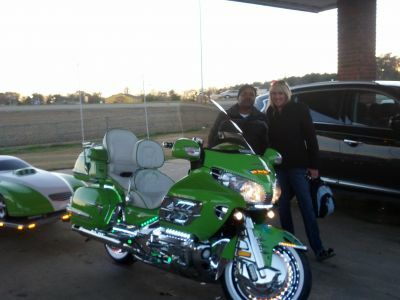 At the cash wash we found a gentleman, Jeffery Adams, who rides with the motor cycle club, Buffalo Soldiers. His bike was UNBELIEVABLE! Also was the fact that he had just retired after 31 years in the Army. I say he went in when he was two, he claims 17! Thank you, SIR for your service and thank you for the tour of your incredible bike. I trust you have or will show up in Daytona Beach or Sturgis. I chatted with another gentleman at the carwash. As it turns out "Bobby" is being treated for diabetes, best wishes to you. Saturday, at the end of the day we had walked 21.7 miles (35 km's), using 43,922 steps, in brand new shoes and picking up $0.32 of which $0.22 was picked up on the bridge over the Mississippi, well beyond the half way point. Findings for the day: 1 book, "The Best Treatment", Isadore Rosenfeld, MD, 3 dimes and 2 pennies. 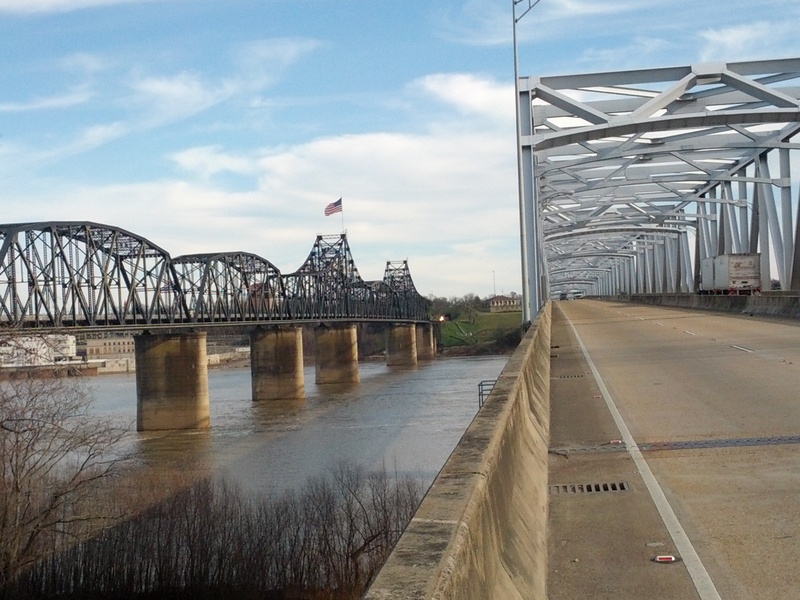 Crossing the bridge across the Mississippi was an adventure. For about 3/4 of a mile the section I had to walk on was a very narrow three feet. Most of the traffic was nice enough to move into the left lane, others however were ignorant of that protocol! A special thanks to "Jessica" who stopped my driver, Valerie, to make a contribution. Thank you very much, Camp UTADA will put it to good use. Walking through Vicksburg was rather odd as everywhere there are statues honoring Confederate States war leaders and just cryptic information describing Union troops. At this point my chosen country is the United States of America, emphasis on the "United" part. I am appreciative of all those who have secured our freedoms and all those who inspired us to rise above some short comings. As Monday is a day set aside to honor and celebrate the life of Martin Luther King, Jr I shall walk to honor his life and the peaceful change by which he lived. I cannot help being touched by the various stories I hear of people whose lives have been impacted by diabetes, people whose lives have been profoundly touched by cancer and by the stories I hear of regular people and the significant service they rendered to their country. Thank you for those who have served in the militaries of both Canada and the US. Bless you who are living with diabetes and cancer and remember all those who did not survive from the deceases or the service. Best wishes to all...CHEERS!!! 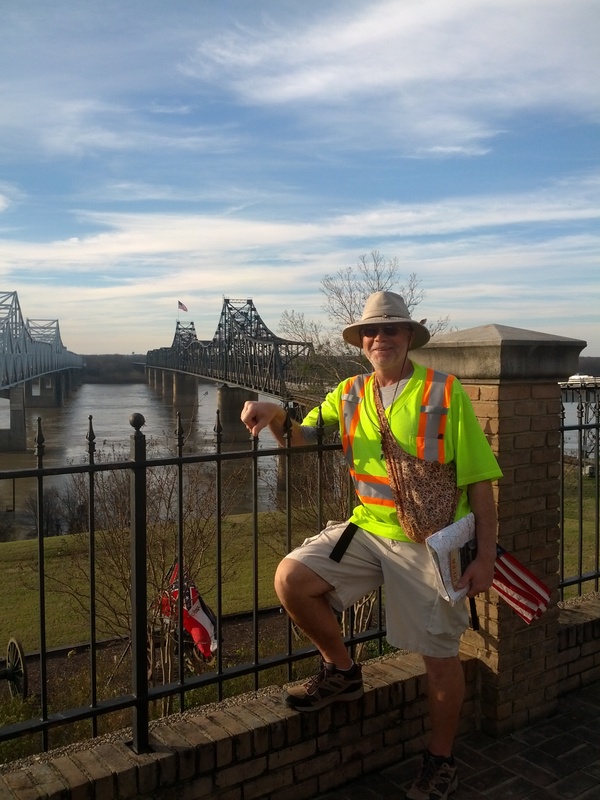 Saturday ended The Walk about 4 miles south in Vicksburg on Old Highway 80. Sunday is a day off and the back at it on Monday. A few more steps south and east. A few more steps to honor wonderful people. A few more steps to doing something that is a wee bit out of the ordinary. See ya'll down the road!!! 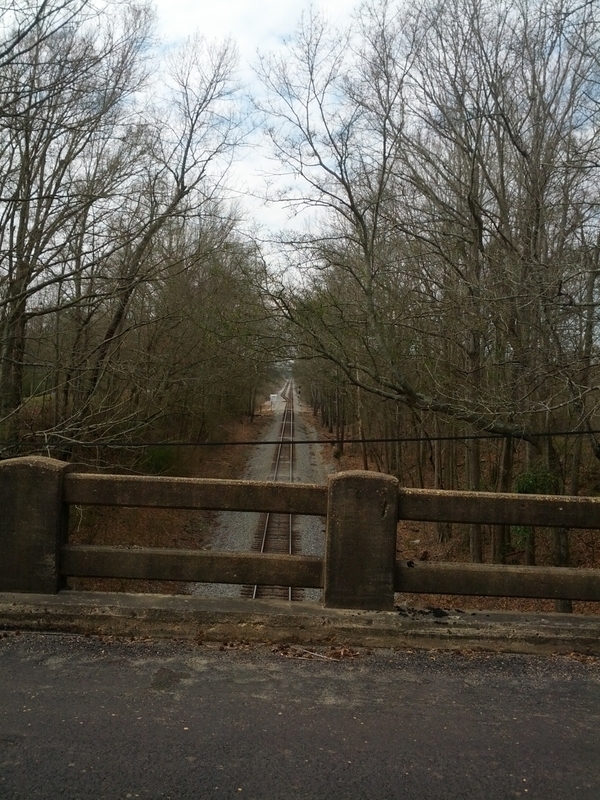 Walking Day#138...Thursday, January 17, 2013...past the vampires and into Tallulah...time to move, again!!! I decided to walk today as the new shoes are still in route, then move on Friday. 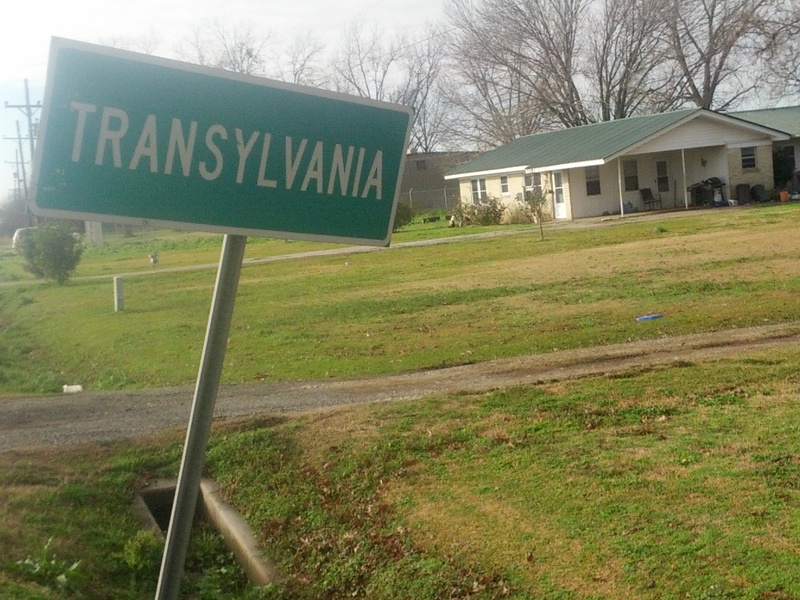 Through Transylvania and on down the road. Good thing we went through in the daylight!! !...and since we are in the "Bible Belt", well let the accompanying picture do the talking!!! Lots of small houses, large estates and huge fields. I can only imagine what it looks like in the summer, as green as it is brownish-grey now. At the end of the day we where just about through Tallulah, Louisiana, having walked 22 miles (35.4839 km"s), using 44,134 steps and picking up $0.30 in loose change. Findings for the day: 1 socket extension, 2 dimes, 1 nickel and 5 pennies. I had a couple of unusual conversations today (more so than usual). One gentleman (a veteran) asked me if I had been saved!?!? (a long time ago!!!) The six "homies" on the corner, enjoying a "beverage". The minister in a town of 2,500 with 32 churches and how the other ministers had conspired against him. Indeed a very odd day. 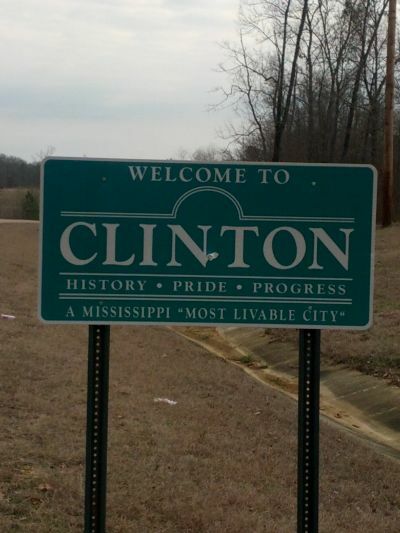 I was just informed that the new shoes arrived today so we can move tomorrow to Clinton, Mississippi (suburb of Jackson) to resume the walk on Saturday. Today we crossed over the 2,900 mile line, 5.5 million steps and $70.19 in change. NEVER underestimate the abilities of the extremely stubborn!!!..cheers!!! 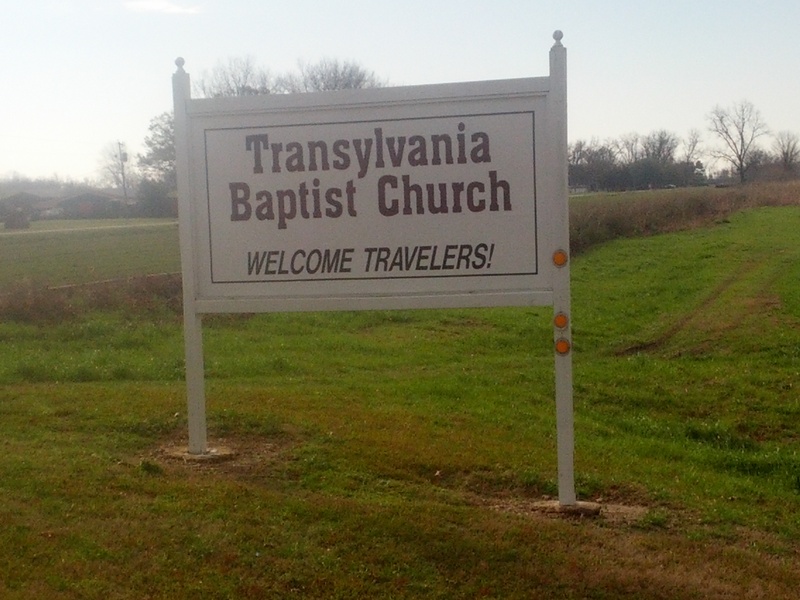 Walking Day #137...Wednesday, January 16,2013...almost to Transylvania, REALLY!! !...yes kids I am walking across the country!!! Wednesday morning, overcast and cold with a tailwind but no rain. I started the day out walking with Steve C from the RV park. He is engaging in a program to change certain behaviors (weight loss) and walking fits right in. We did a pleasant 3.1 miles (5 km's), solved at least half the world's problems in the process. On through Lake Providence and beyond. On the trip out to the starting point I received a call from Laura Laird (her father, Bert is one of the honorees), a sixth grade teacher in the Miami area as her class doubted that some people they are studying could walk from Alabama to Colorado. She wanted to use me as an object lesson. Thanks for the opportunity and it was good to hear your voice again. I must say that some of these little towns that we have going through seem to have a significant amount of poverty (condition of buildings being the measure). I know there are poor people in this country but this is the first time I have seen the dual poor. It takes my back to where I grew up in a rather obscure part of Manitoba. I feel fortunate that I was able to get an education to move beyond that level of significant poverty. When the day was over we had covered 20.6 miles (33.2258 km's), used 43,111 steps and picked up $0.68. Findings of the day: 1 odd wrench used on irrigation systems, 1 quarter, 3 dimes, 1 nickel and 8 pennies. I have five new pairs of shoes headed in this direction but have yet to see them. We were originally going to move tomorrow but since the shoes have not shown up I do believe I shall walk tomorrow and move Friday. We stopped a couple of miles shy of Transylvania and should make it to Tallulah tomorrow. Cheers!